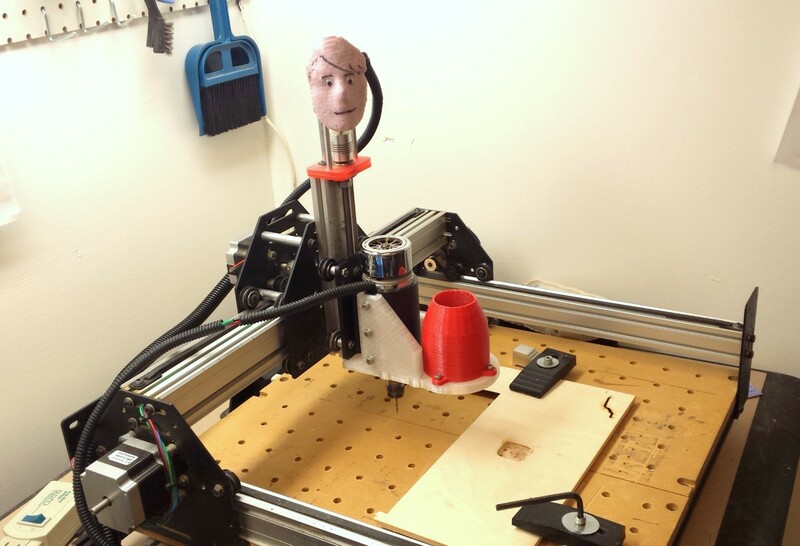 This is to help anyone use the CUC Fab Lab’s shapeoko milling machine for single sided milling. 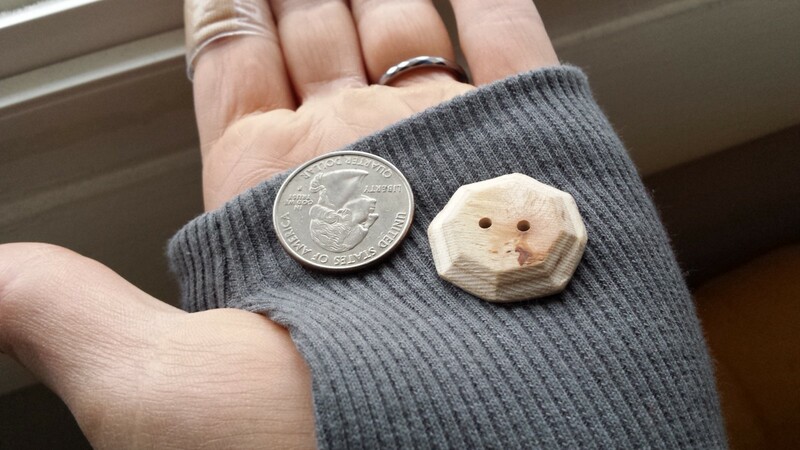 My end result is a wooden button that I designed using Tinkercad’s free 3D design software. I designed it to be simple, small, and quick to demonstrate the process. 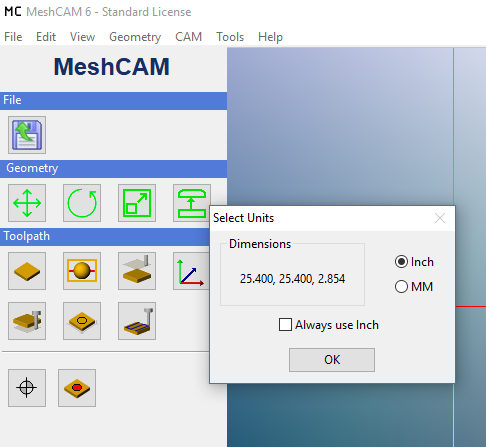 First, you’ll need to decide on a 3D file, it is helpful to have it scaled to actual size in it’s STL format. 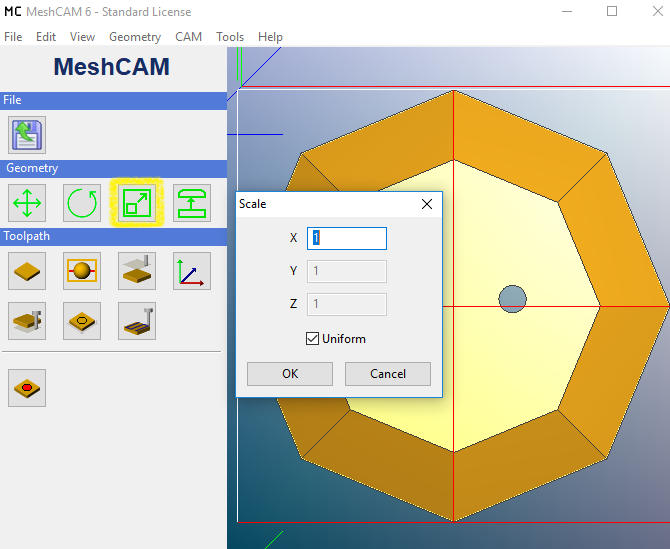 Meshcam can open STL, DXF, PNG, JPG, BMP, and it’s own MCF or meshcam file. 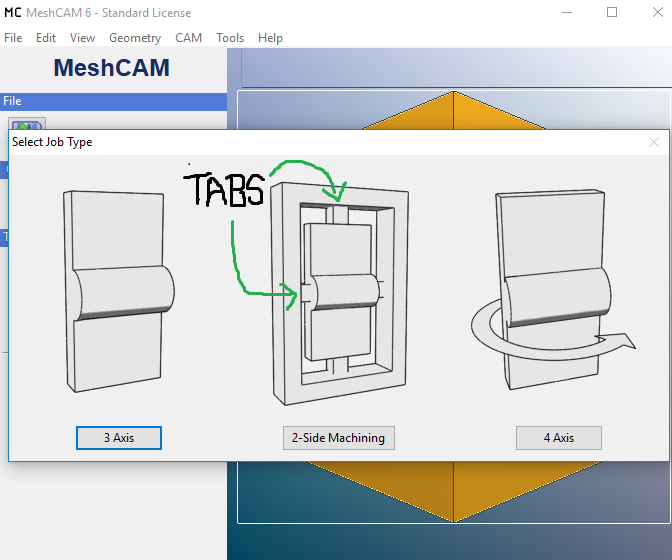 I imported my STL from Tinkercad into Meshcam. I’m not sure why but this window will pop up saying your file is way bigger than it should be. 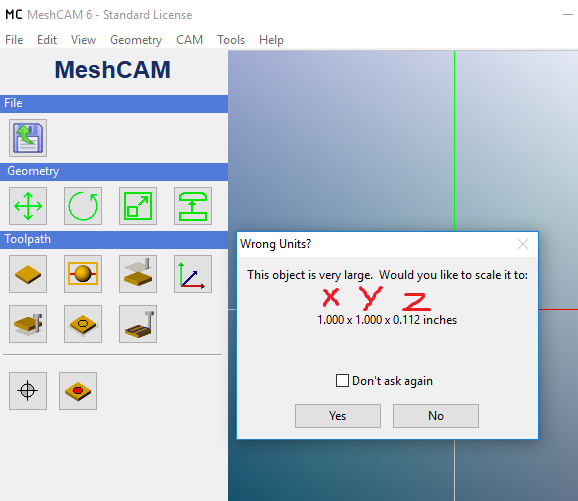 This pop up allows you to change you units of measurement. I’ll be using inches because it’s what I know. Select your preference but please don’t select the box to always use one. It’s nice having the option every time for different users at our lab. The next pop up is saying your file is very large and would you like to scale it to what it’s supposed to be? 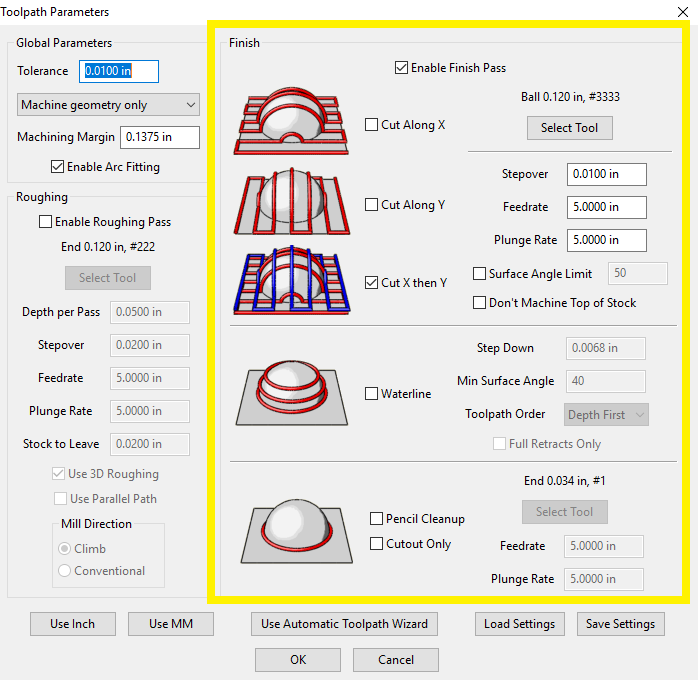 This is important especially when it comes to the thickness of the material you plan on milling. If you haven’t measured your material’s thickness, do it now so you can confirm your 3D file will fit! 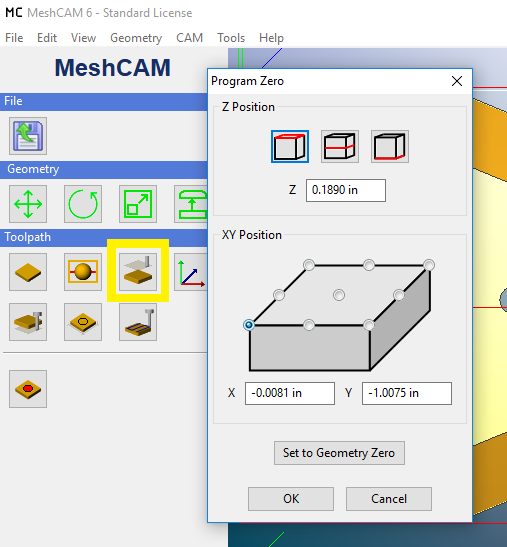 If your material is thicker than the z axis in your imported STL file, you will need to resize the STL or rescale it in Meshcam. Next, you are required to select your milling options. I chose 2 sided machining. Since I’m only securing my wood with clamps, I need the tabs. If you were to secure your milling material with adhesive or vacuum suction, 3 axis could be used. 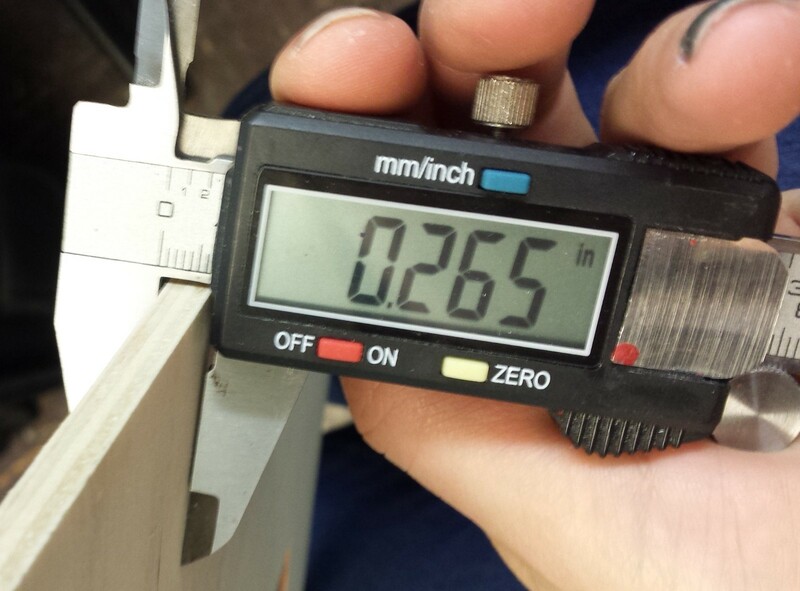 The highlighted box is to define your stock-material to be milled. You don’t need to change anything here. Highlighted box shows support dimensions, or your tabs. The default settings here work great! 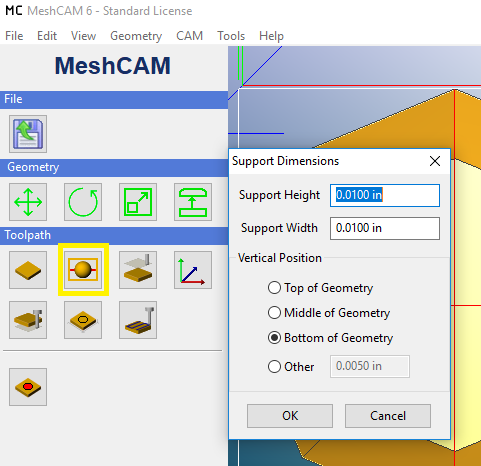 The second part of your support dimensions is to declare where they will go. The software is smart in that it suggests where to put your tabs. I simply clicked on the thin red lines that were there, making them bolder and telling Meshcam to include them in the g code. Program zero is pretty self explanatory. I selected the bottom left corner as my “home” or starting point for milling. Easel uses this point too. Setting your max depth is important. If I only milled halfway through the material I wouldn’t be able to remove my button! Make sure you select the correct depth. Don’t forget to select your region type! 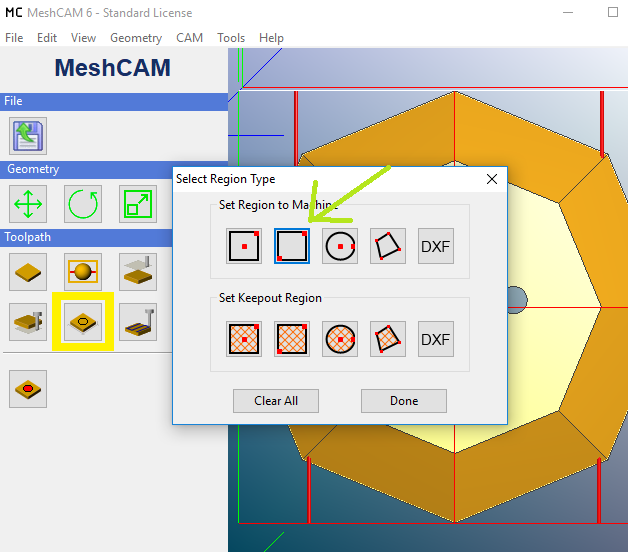 After you click done you will need to click on the area around your 3D file to define your region. 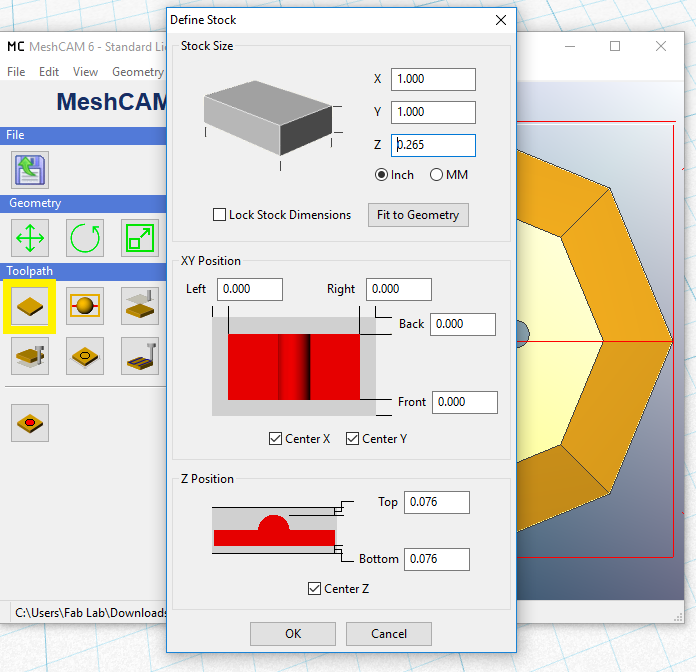 The last icon allows you to set your tool path parameters. To achieve a smoothly milled product, you will have to use two different paths and two different g codes. Your roughing pass happens first. The photo above is highlighted to show your rough cut options. 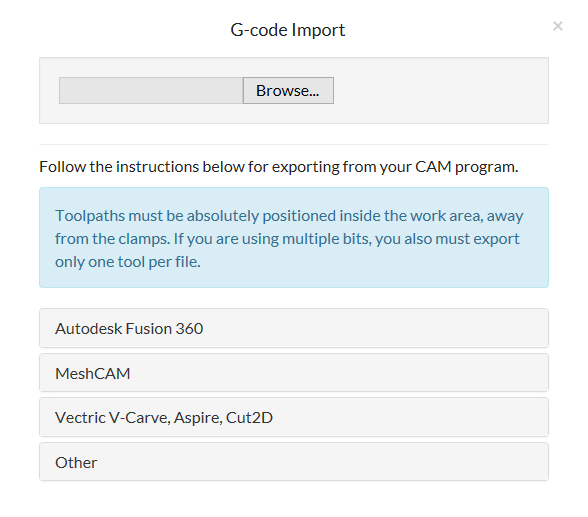 Click on the “select tool” box, to select different bits, when you select one, it will confirm you want to use the default parameters. If you need to enter in your own new bit’s options, you can also add a new tool in the “select tool” box. 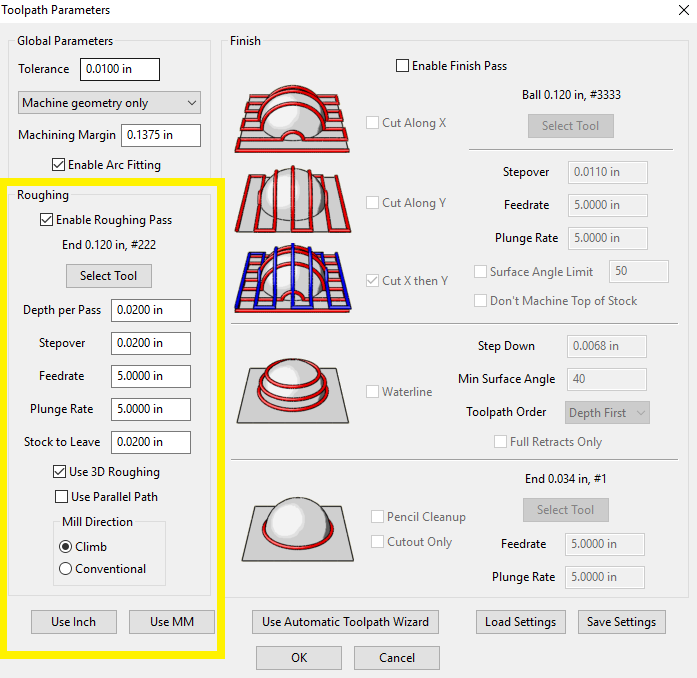 If a job is unnecessarily long, you can adjust the speed by changing the depth per pass and stepover, but only do so by small amounts and testing with foam first to avoid breaking bits! 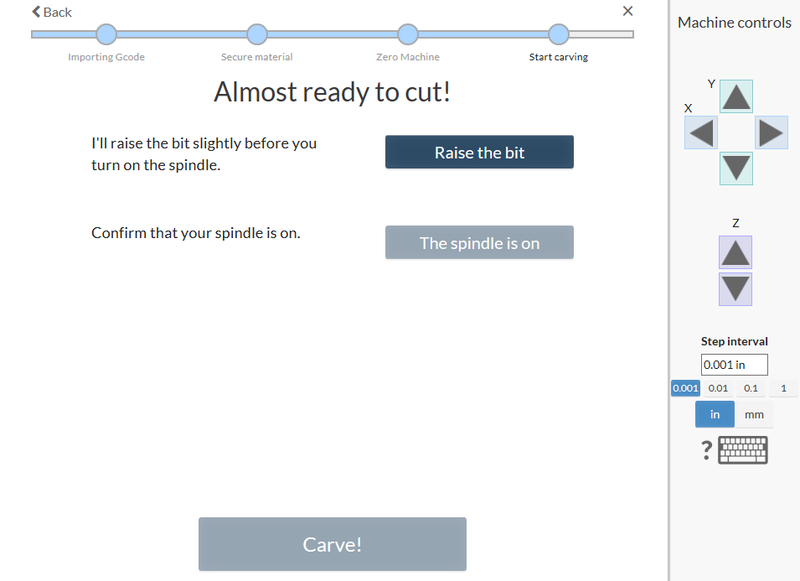 When you are satisfied with your bit choice and settings, click OK to find out how long your job will take. 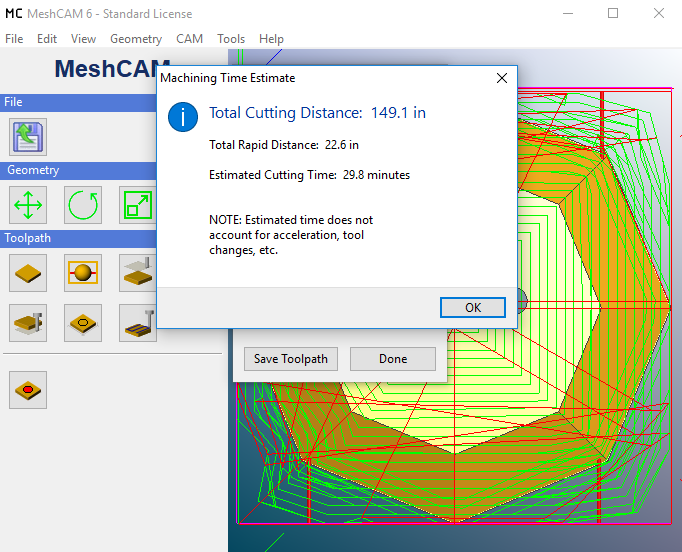 Once rough cut is set and the time it takes works for you, save your toolpath as basic GCode as shown above! 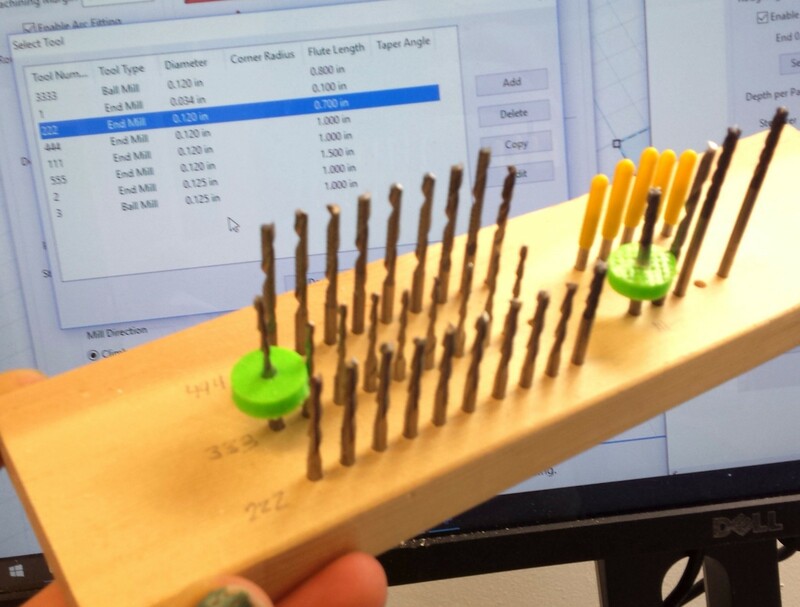 After you’ve saved your roughing cut, you’re ready to save your finishing cuts! 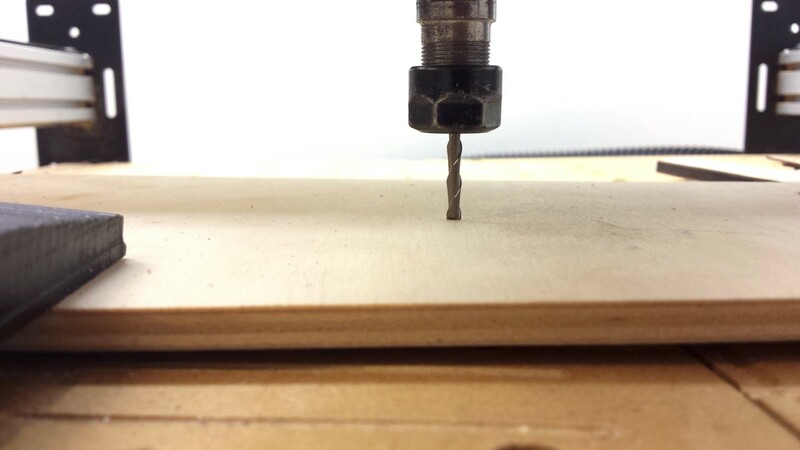 I decided on cutting X then Y with a rounded ball end mill for smoothness. I haven’t tried waterline or pencil cleanup, but feel free to experiment! 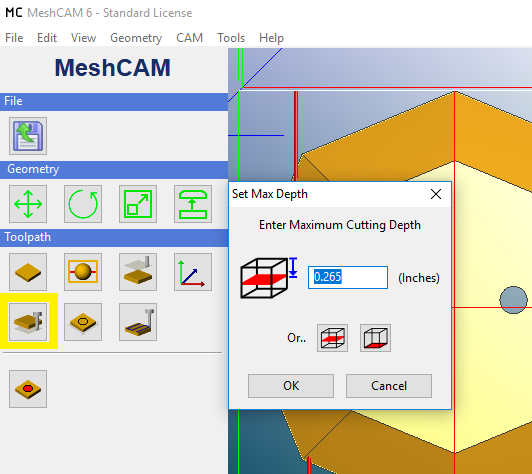 Don’t forget to click OK, check the time, and save your GCode just like you did with the rough cut. Whew! We’re done with Meshcam-time for Easel! Easel is made by the company ‘Inventables’ and has tons of helpful forums and support. 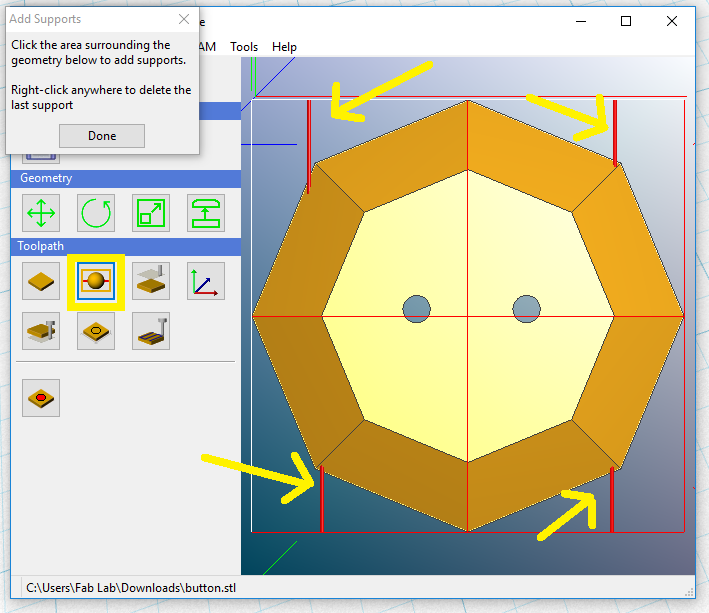 There are several neat apps it can use to do a variety of milling jobs. 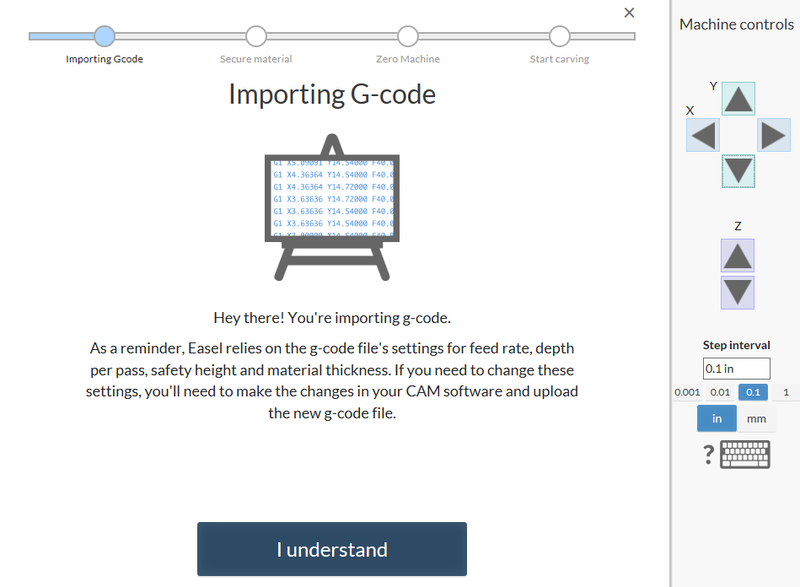 For our G code we just made though, start a new project and import it! I love how simple Easel is to use, once you have imported your gcode, it takes you through the steps you need to do before you begin milling. You need to make sure your material is secure. 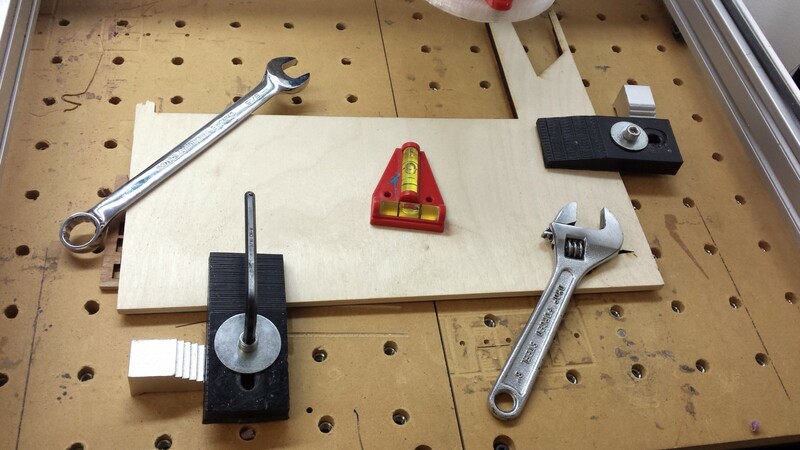 Start by laying a scrap board beneath your stock. 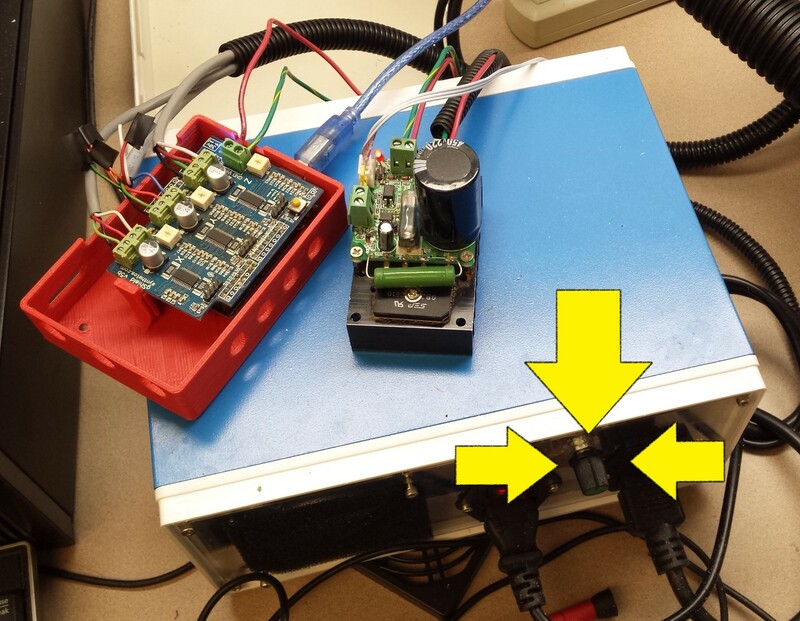 This prevents the bit from potentially digging into the bed of our Shapeoko. Then secure your material using clamps, two is safer than one! It is good practice to confirm your bed is level as well. 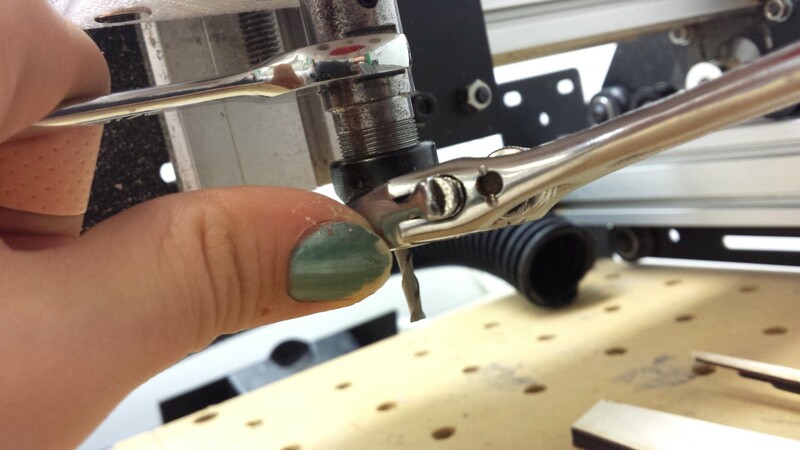 Changing you bit can be tricky, you will two wrenches as shown above. Righty tight, lefty loosey. If you are using a delicate, thin bit, keep a finger on it to prevent it from falling loose from the collet and breaking on the bed below. The collet is the metal tube thing that holds the milling bits! Once your material is secure, and your bit is properly installed, it is time to zero the machine, or set the “home”. The ideal home is at the bottom left corner of your stock, so that your Gcode will fit, and with the bit just barely touching the material. Too much pressure and it will mill deeper than it should, too little and it won’t mill enough! After those 3 important steps, you’re almost ready to cut! To turn the spindle on, turn the knob on the box shown below! Happy milling! Easel has a pause and stop option in the top right corner of your screen after you’ve started your milling job. It also gives a time estimate. I realized after the button was milled that I didn’t include the holes in my gcode-derp! 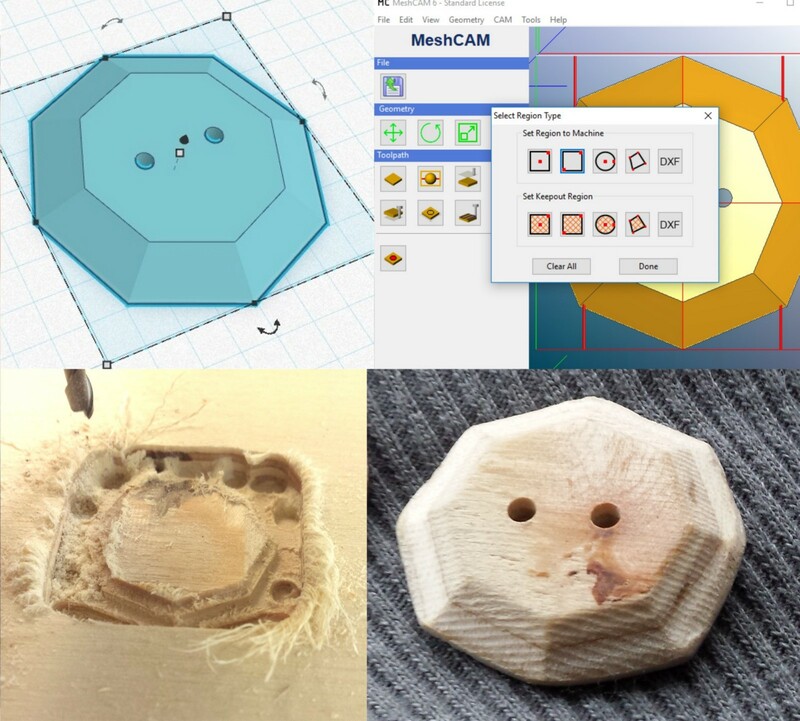 I manually drilled the holes with the shapeoko but if you want to include them in your gcode, make sure you click on the very bottom icon in Meshcam to adjust. I like making things. A lot.